Why does hail form and how does hail form? 6 inch hail – the size of a grapefruit. Aggregate hailstone. 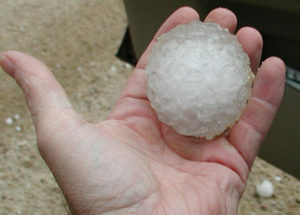 Large hailstone with smaller stones visible. Ruler shows radius of this remarkable hail stone. Diameter is approximately 6 inches – the size of a grapefruit. Credit: NOAA Photo Library, NOAA Central Library. This is my worst nightmare as a storm chaser since large hail will break out your car windows fast and that ends your chase right there. How does large hail form or why does hail form? People may not be used to seeing hail at their summerhouses, but during a thunderstorm hail can be a very common thing in some areas. Hail is formed from updrafts within thunderstorms as it pushes rain high into the cloud where very cold air freezes it. Once frozen it starts to fall but gets caught in another strong updraft where it gathers more moisture on its way back up making it larger. If the updrafts are strong enough they will continue this process for long periods of time allowing the hail to accumulate more moisture and more moisture. In a severe thunderstorm downdrafts may act like a wedge and increase the intensity of the updraft. Updrafts can get so strong they even intrude into the stable stratosphere. When updrafts are this strong it becomes possible to suspend large hail for long periods of time further adding moisture to the hail, sometimes building it to incredible sizes. Updraft winds can be from 100 to 120 miles per hour when producing baseball and larger size hail. Below are a couple of hail photos I took while chasing tornadoes in Colorado. After this storm chase my car had many new large dents in it, but my windows survived. Click this photo below to watch this movie of hail forming in an thunderstorm. It gives you a good idea of where it will fall in relationship to where the tornado will drop in a severe storm. When large hail falls with strong winds, it can become a deadly projectile. Ranchers across America tell stories about hail storms that had killed their cattle because they were trapped in an open field during a thunderstorm. Scientists commissioned by the National Geographic television channel studying the remains of 200 people buried in Himalayas dating from the 9th century found that Giant hail apparently killed them. According to the Guinness Book of World Records, the heaviest hailstones on record weighed up to 2.2lb and killed 92 people in Bangladesh in 1986. So when you storm chase if you plan on getting out of the car while it is hailing I highly recommend wearing a helmet or hard hat. I’ve seen a storm chaser with head injuries from large hail, so take the appropriate steps to stay safe. Hail sometimes has jagged cutting edges. 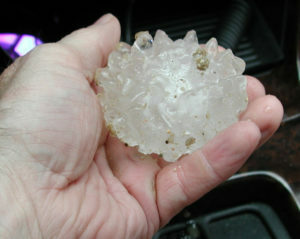 ■ Hail is larger than sleet, and forms only in thunderstorms. 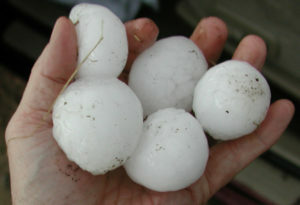 ■ Large hailstones can fall at speeds faster than 100 mph! ■ The largest hailstone ever recovered in the United States was a 7 inch wide chunk of ice that landed in Aurora, Nebraska, in June 2003. ■ An accurate weight could not be determined for the Aurora hailstone. 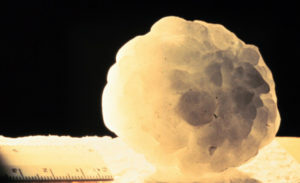 A 1970 Coffeyville, Kansas, hailstone weighing 1.67 pounds with a 5.7 inch diameter remains the heaviest hailstone weighed and verified in the United States.